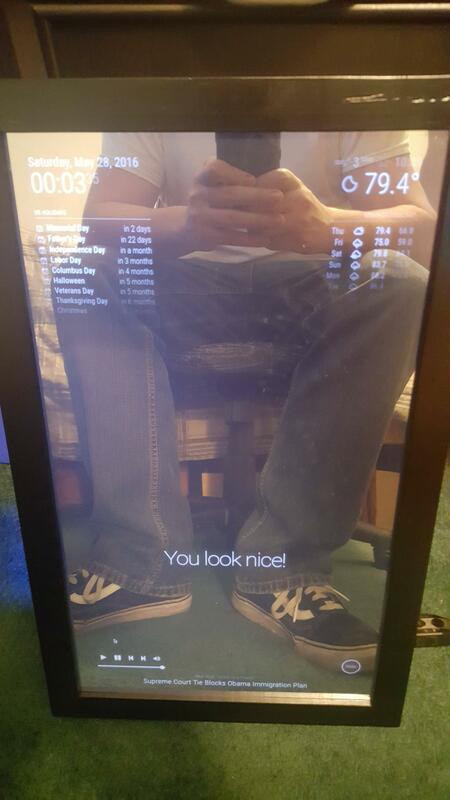 Just wanted to post an updated version of my touch screen mirror. First, a picture of the frame and the mirror itself. And a little demo video of the touch screen in action. If you’re interested, I will gladly post a video or instructions on how I got this working. Let me know if you’d like to see that. It is still responsive with use of the spy glass in front of it. What does i need to do and look for to upgrade my non touch screen MagicMirror? @EoF Please add me to the list of folk eagerly awaiting “how-to” instructions! I’m assembling my materials to start my mirror and want to have mine be touch screen capable. I have a touch screen monitor sitting here that would be perfect if I can actually use a touch monitor. Essentially, this is a normal monitor with a resisitve touch screen panel kit over top of it that has 2 way mirror film overlaying it. I don’t know if I will have the time to write up a full guide on this, but I will be happy to answer questions. could you show me your config.js. A want to learn about how to integrate the music. This I think but not sure about the touch side. Hi! Sorry, I did not see your reply @shgmongohh. Yes, it is simply my music player module.